Many of you know that we (Jan Graham and husband Gary Marquardt) lived in Australia. We had the privilege of meeting Neville and his wife Enid Connors and touring their aviary. Their commitment to the black cockatoos of Australia (as well as their own big macaws) was very evident during our brief time together so we are very excited to be able to offer you their book. 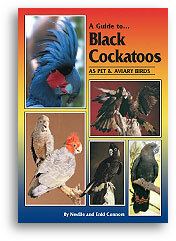 This full-color book features 300 photographs and covers all six black cockatoo species. Topics include housing, feeding, artificial incubation, handrearing, companion birds, taming and training, and diseases and disorders. The individual species section extensively covers all species and subspecies of the genus Calyptorhynchus in the wild and in captivity: the Palm Cockatoo (Probosciger aterrimus) and the Gang Gang Cockatoo (Callocephalon fimbraitum).